Paprika is one of those spices that seemingly carries history upon it’s scent. At least it does for me. Whenever I breathe in the smokiness of the dried pepper blend, I immediately imagine bazaars teeming with clamourous commerce in exotic eastern locales or dusty dry mediterranean towns sitting within the watchful shadow of boxy castles set upon distant hillsides. Paprika is a spice that has stories to tell. 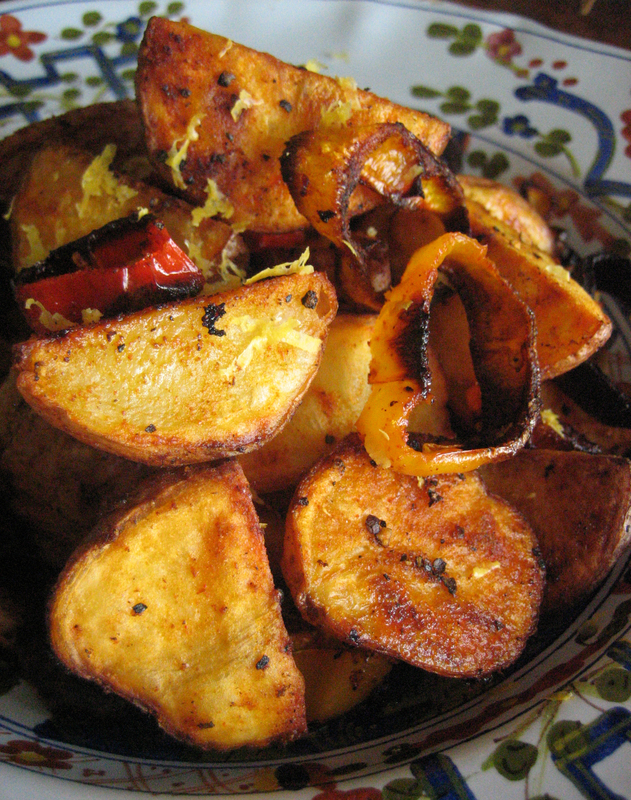 There really isn’t anything simpler or more comforting than a dish of roasted potatoes. Thing is, simply by adding some spicy hot paprika prior to roasting and a light dusting of lemon zest afterward, this very simple dish is elegantly transformed into the exotically sublime. Cut potatoes into bite-sized pieces and place into a bowl. Add the garlic, bell peppers and paprika. Add a drizzle of olive oil. Mix well to evenly distribute the paprika. Transfer to a Silpat-covered or non-stick baking sheet and roast for 40-45 minutes until the potatoes are browned. Season with salt and pepper. Garnish with lemon zest. Thank you Rebecca, they were! *ANYTHING* with “12 cloves of garlic” in the ingredient list is going to be a hit with me… MUST MUST MUST try these soon!! Simplicity at it’s best. Lovely capture of these roasted tots! Thank you, Miroslava! Sometimes, nothing can surpass a simple pleasure.